- Queridos filhinhos, preciso ir à floresta busar comida. Tenham muito cuidado por causa do lobo mau. Se ele entrar aqui, vai devorá-los todos. É seu costume disfarçar-se, mas vocês o reconhecerão pelas sua voz rouca e por suas patas pretas. - Abram a porta, queridos filhinhos. A mamãe está aqui e trouxe um presentinho para cada um de vocês. - Não abriremos a porta, não! Você não é nossa mãezinha. Ela tem uma voz macia e agradável. A sua é rouca. Você é o lobo mau ! - Abram a porta, meus filhinhos. A mamãe já voltou e trouxe um doce para cada um de vocês. - Não abriremos a porta, não! Nossa mãe não tem patas pretas como as suas. Você é o lobo mau ! - Tenho as patas feridas. Preciso esfregá-las em um pouco de farinha. O padeiro pensou consigo mesmo: "Esse lobo está querendo enganar alguém". E recusou-se a fazer o que ele pedia. O lobo, porém, ameaçou devorá-lo; e o padeiro, com medo, esfregou-lhe bastante farinha nas patas. - Meus filhinhos, abram a porta. A mãezinha já está aqui, de volta da floresta, e trouxe um brinquedo para cada um de vocês. - Primeiro mostre-nos suas patas, para vermos se você é mesmo nossa mãezinha. O lobo pôs as patas na janela e, quando eles viram que eram brancas, acreditaram e abriram a porta. Mas, que surpresa!!! Ficaram apavorados quando viram o lobo entrar. Procuraram esconder-se depressa. Um entrou debaixo da mesa; outro meteu-se na cama, debaixo do cobertor; o terceiro entrou no fogão; o quarto escondeu-se na cozinha; o quinto, dentro do armário guarda-louças; o sexto, embaixo de uma tina tanque de lavar roupas, e o sétimo, o menorzinho, na caixa do relógio cuco. O lobo mau os foi achando e comendo, um a um. Só escapou o menor, que estava na caixa do relógio cuco. Quando satisfez o seu apetite, saiu e, mais adiante, deitou-se num gramado. Daí a pouco pegou no sono. - Mãezinha querida, estou aqui, no relógio cuco. Ela o tirou de lá, e ele lhe contou tudo o que havia acontecido. A pobre cabra chorou ao pensar no triste fim de seus filhotinhos !!! Alguns minutos depois, ela saiu e foi andando tristemente pela redondeza. O cabritinho acompanhou-a. Quando chegaram ao gramado, viram o lobo dormindo, debaixo de uma árvore. Ele roncava tanto que os galhos da árvore balançavam. A cabra reparou que alguma coisa se movia dentro da barriga do lobo. - Oh! Será possível que meus filhinhos ainda estejam vivos, dentro da barriga do lobo? pensou ela falando alto. Então, o cabritinho correu até sua casa e trouxe uma tesoura, agulha e linha. Mal a cabra fez um corte na barriga do lobo malvado, um cabritinho pôs a cabeça para fora. Ela cortou mais um pouco e os seis saltaram, um a um. Mas depois, que coisa estranha! “Si no lo haces, te devoro.” El hombre, asustado, le blanqueó la pata. Sí, así es la gente. La fiera puso la pata en la ventana, y, al ver ellas que era blanca, creyeron que eran verdad sus palabras y se apresuraron a abrir. Pero fue el lobo quien entró. ¡Qué sobresalto, Dios mío! ¡Y qué prisas por esconderse todas! Metióse una debajo de la mesa; la otra, en la cama; la tercera, en el horno; la cuarta, en la cocina; la quinta, en el armario; la sexta, debajo de la fregadera, y la más pequeña, en la caja del reloj. Pero el lobo fue descubriéndolas una tras otra y, sin gastar cumplidos, se las engulló a todas menos a la más pequeñita que, oculta en la caja del reloj, pudo escapar a sus pesquisas. Ya ahíto y satisfecho, el lobo se alejó a un trote ligero y, llegado a un verde prado, tumbóse a dormir a la sombra de un árbol. Cuando ya no le quedaban más lágrimas, salió al campo en compañía de su pequeña, y, al llegar al prado, vio al lobo dormido debajo del árbol, roncando tan fuertemente que hacía temblar las ramas. Al observarlo de cerca, parecióle que algo se movía y agitaba en su abultada barriga. La madre penso: ¡Válgame Dios!¿si serán mis pobres hijitas, que se las ha merendado y que están vivas aún? Y, con su madre, pusiéronse a bailar en coro en torno al pozo. The wretch often disguises himself, but he may always be known by his hoarse voice and black paws.” - “Dear mother,” answered the kids, “you need not be afraid, we will take good care of ourselves.” And the mother bleated good-bye, and went on her way with an easy mind. 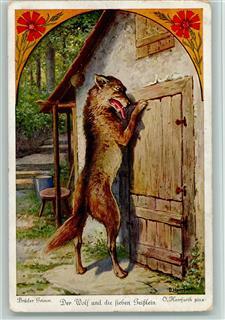 It was not long before some one came knocking at the house-door, and crying out: “Open the door, my dear children, your mother is come back, and has brought each of you something.” But the little kids knew it was the wolf by the hoarse voice. 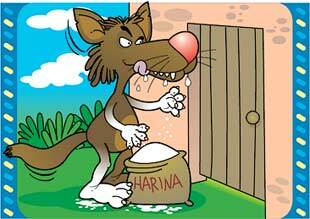 “We will not open the door,” cried they; “you are not our mother, she has a delicate and sweet voice, and your voice is hoarse; you must be the wolf.” Then off went the wolf to a shop and bought a big lump of chalk, and ate it up to make his voice soft. And then he came back, knocked at the house-door, and cried: “Open the door, my dear children, your mother is here, and has brought each of you something.” But the wolf had put up his black paws against the window, and the kids seeing this, cried out, “We will not open the door; our mother has no black paws like you; you must be the wolf.” The wolf then ran to a baker. “Baker,” said he, “I am hurt in the foot; pray spread some dough over the place.” And when the baker had plastered his feet, he ran to the miller. “Miller,” said he, “strew me some white meal over my paws.” But the miller refused, thinking the wolf must be meaning harm to some one. “If you don't do it,” cried the wolf, “I'll eat you up!” And the miller was afraid and did as he was told. And that just shows what men are. And now came the rogue the third time to the door and knocked. “Open, children!” cried he. “Your dear mother has come home, and brought you each something from the wood.” - “First show us your paws,” said the kids, “so that we may know if you are really our mother or not.” And he put up his paws against the window, and when they saw that they were white, all seemed right, and they opened the door. And when he was inside they saw it was the wolf, and they were terrified and tried to hide themselves. One ran under the table, the second got into the bed, the third into the oven, the fourth in the kitchen, the fifth in the cupboard, the sixth under the sink, the seventh in the clock-case. But the wolf found them all, and gave them short shrift; one after the other he swallowed down, all but the youngest, who was hid in the clock-case. And so the wolf, having got what he wanted, strolled forth into the green meadows, and laying himself down under a tree, he fell asleep. Not long after, the mother goat came back from the wood; and, oh! what a sight met her eyes! the door was standing wide open, table, chairs, and stools, all thrown about, dishes broken, quilt and pillows torn off the bed. She sought her children, they were nowhere to be found. She called to each of them by name, but nobody answered, until she came to the name of the youngest. “Here I am, mother,” a little voice cried, “here, in the clock case.” And so she helped him out, and heard how the wolf had come, and eaten all the rest. And you may think how she cried for the loss of her dear children. At last in her grief she wandered out of doors, and the youngest kid with her; and when they came into the meadow, there they saw the wolf lying under a tree, and snoring so that the branches shook. The mother goat looked at him carefully on all sides and she noticed how something inside his body was moving and struggling. Dear me! thought she, can it be that my poor children that he devoured for his evening meal are still alive? And she sent the little kid back to the house for a pair of shears, and needle, and thread. 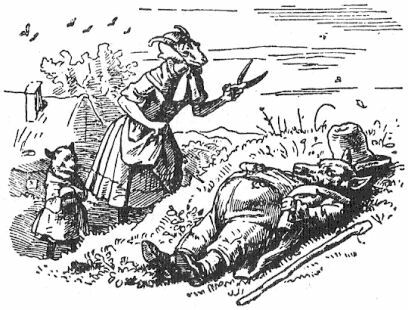 Then she cut the wolf's body open, and no sooner had she made one snip than out came the head of one of the kids, and then another snip, and then one after the other the six little kids all jumped out alive and well, for in his greediness the rogue had swallowed them down whole. How delightful this was! so they comforted their dear mother and hopped about like tailors at a wedding. “Now fetch some good hard stones,” said the mother, “and we will fill his body with them, as he lies asleep.” And so they fetched some in all haste, and put them inside him, and the mother sewed him up so quickly again that he was none the wiser. So he came to the brook, and stooped to drink, but the heavy stones weighed him down, so he fell over into the water and was drowned. And when the seven little kids saw it they came up running. “The wolf is dead, the wolf is dead!” they cried, and taking hands, they danced with their mother all about the place. Es war einmal eine alte Geiß, die hatte sieben junge Geißlein, und hatte sie lieb, wie eine Mutter ihre Kinder lieb hat. Eines Tages wollte sie in den Wald gehen und Futter holen, da rief sie alle sieben herbei und sprach: “Liebe Kinder, ich will hinaus in den Wald, seid auf eurer Hut vor dem Wolf, wenn er hereinkommt, so frißt er euch mit Haut und Haar. Der Bösewicht verstellt sich oft, aber an seiner rauhen Stimme und an seinen schwarzen Füßen werdet ihr ihn gleich erkennen.” Die Geißlein sagten: “Liebe Mutter, wir wollen uns schon in acht nehmen, Ihr könnt ohne Sorge fortgehen.” Da meckerte die Alte und machte sich getrost auf den Weg. Und als er an den Brunnen kam und sich über das Wasser bückte und trinken wollte, da zogen ihn die schweren Steine hinein, und er mußte jämmerlich ersaufen. Als die sieben Geißlein das sahen, kamen sie eilig herbeigelaufen und riefen laut: “Der Wolf ist tot! Der Wolf ist tot!” und tanzten mit ihrer Mutter vor Freude um den Brunnen herum. fala realmente a historia e porisso eu falo parabens para essa pessoa que escreveu esta historia. Comentário: Parabéns, pela ilustração do texto, bem didático. Ajudou bastante meu filho de 07 anos nos trabalhos escolares e no aprendizado diante da leitura.